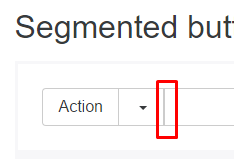 The left aligned segmented buttons appears to have a double border. Upon zooming in it seemed to disappear though. Want me to close this one? The issue you referenced mentions this should be reviewed in v4. Seems to be fixed in Chrome Canary 47.0.2517.0 ! It's been fixed in WebKit Nightly!